As the hunt for tickets for Sunday week’s All-Ireland hurling final between Galway and Limerick intensified last evening, it was confirmed that thousands of ticketless fans will be able to watch the match on a big screen in Eyre Square. More than 7,000 fans thronged the square last September to watch Galway win their first title since 1988, and the organisers — the Galway City Business Association — are hoping that will be a lucky omen and have applied to the city council for a permit to hold the event. With both the minor and senior teams competing in the finals at Croke Park on August 19, the big screen will be switched on at 12.45, a quarter of an hour before the minor match. 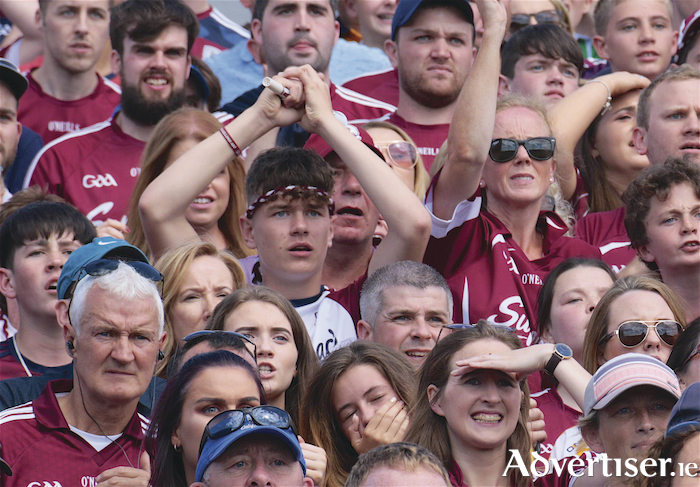 City Mayor Niall McNelis last evening appealed to all the businesses in the city and beyond to make sure they are decked out in maroon for what promises to be an exciting autumn for Galway GAA. There is still hope that Galway may have more All-Ireland finalists with the minor and senior footballers contesting semi-finals in Croke Park this Saturday; and the camogie and ladies football teams involved in crucial games that could see them win senior titles. The minor and senior Galway hurling teams fulfilled their final media duties yesterday morning in Loughrea when they held their pre-final media briefing. Managers Micheal Donoghue and Jeff Lynskey and representatives of the players met national and regional media at an event in the Loughrea Hotel and Spa. They will not engage in any media duties from now until the aftermath of Sunday week’s finals. For reports and reviews of last Sunday’s action, see Ray Silke’s reports ion our sports pages.